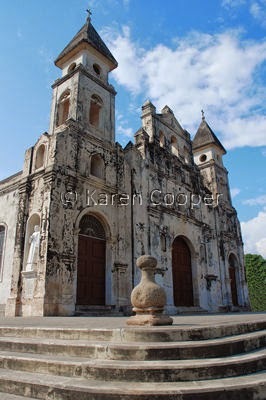 There are 6 magnificent cathedrals in Granada, Nicaragua. Huge, massive structures each with its own haunting elegance. This is Guadalupe Cathedral, built in 1626. Honest. I don't kid about this history stuff. Frankly, I can't stretch my mind far enough back to imagine yesterday, much less over 300 years ago. So, being a wee bit older than most of us, I guess we can excuse Guadalupe for being a bit stained and worn. You should see me before morning coffee! I can't find a lot written about Guadalupe. She was used by William Walker (the man who tried to be King of Nicaragua .. everyone has a dream!) in 1856 as his last stand in Granada. Nice digs for a last ditch effort at taking over a country. Didn't work out for Bill, though. He could have been a whole trilogy of psychology books unto himself. What really intrigues me about these cathedrals is the more-than-just-rumor of an underground tunnel that connects all 6 of them. When you see the cathedrals from higher up, this makes sense as they are aligned in almost a straight line. Guadalupe is the one closest to the lake. During the time of pirates and the pillaging of Granada, it would be fortuitous to have a way for people and goods to escape. I have spoken to a number of natives of Granada who have seen this tunnel in days gone by. Though any modern day trace seems to either have vanished or is blocked up. I have more research to do on this. I just can't let a good mystery go unsolved. Great Information.. something I would want to know about cathedrals around the world ! Very interesting about the tunnels. Your blog seems quite interesting... Great information..